Having shown consumers last year that its interchangeable lithium-ion battery pack is a game changer for powered lawn equipment, Ego Power+ is back this year to demonstrate that not only are its products revolutionary, they offer better performance than their gas-powered competitors. A new campaign for the brand, from The Escape Pod in Chicago, continues to keep the products in the lab to showcase the tools’ performance capabilities. 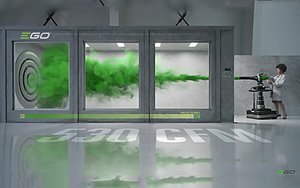 One ad shows a self-propelled lawn mower rolling up a tilting indoor lawn in a lab with ease, while another shows a leaf blower filling a room with colored smoke. Voiceovers highlight the tool’s “superior power” and makes comparisons to gas-powered equipment, which is often viewed as superior. This is the second-year of the brand’s lab-based campaign. Last year, the brand introduced itself to the masses with a series of ads that showcased the interchangeable 56-volt lithium ion battery. After a year of favorable reviews for the product, it’s now time to focus on the tools’ capabilities.